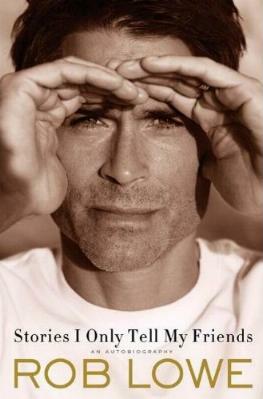 Truly one of the most beautiful people on screen, Rob Lowe is still going strong. I remember his gorgeous, even pretty, face on magazine covers back in the '80s, soliciting sighs and dreams of many a young woman. Naturally, there's more to a person than their looks, and from his book, there certainly is in his case. Not the goody-goody this fresh-faced kid appeared to be, he tells the stories of his life with candor, and he really has a way with words. He describes growing up in Dayton, Ohio so vividly that you can almost see a young Rob and his friends playing. Then he and his two brothers and mother move to Malibu to a completely different way of life. Also, he's nearer to his dream of becoming an actor, the result of being bitten by the acting bug back in Ohio. That bug has never left him. Being the new kid at school, Lowe was not popular and didn't really fit in, but, at 15, had landed himself a role on television. It's fun reading about a young Holly Robinson, Charlie Sheen, Emilio Estevez, and Chris and Sean Penn as they hung out together or met at auditions. He talks about his early foray into television, the pressures, fellow actors, girlfriends, and "the fans". Not a cake walk by any means but he met up with some amazing people (Cary Grant, Francis Ford Coppola, Martin Sheen, and Jacqueline Bisset to name a few). Lowe's recollections of the making of his first movie, The Outsiders, is riveting, not to mention very interesting. As are his stories about his other films and the making of movies in general. A rare look into the inner workings of how movies are made, from casting to shooting, and surviving the process. By now we know he's not only a movie star, but that he's also a television star, and for those who didn't know, also stage actor and very into politics. Lowe talks lovingly about meeting his wife Sheryl and their life together, as well as their two sons. He recalls his visit to rehab back in 1990 and his subsequent sobriety. Life was lived in excess; not any more. Although he talks about his conquests, this is not a tacky book by any means. On the contrary; it's very respectful, and I appreciate that both as a reader and as a woman. A "writer" doesn't need a ghostwriter, as do so many "authors" today, and Mr. Lowe is a bona fide writer. Conclusion - An eloquent look at the life of one of America's most well known and beloved stars. A very interesting read and worthy of a rare three stars!